Laura did a fine job. She was very well informed on Florentine history, architecture, art and culture, and was pleasant. She paced the tour well. When we wanted a coffee break she brought us to a lovely old pastry shop by the Duomo. When we asked about English language bookstores she gave us names and locations. Those types of personalized details made the tour all the more enjoyable and reflected her detailed knowledge of the city. We would use her again. Laura was an amazing guide. Grew up in the states but has lived in Florence for the majority of her life. You can tell she loves what she does and my kids loved her as well as the adults! She had interesting facts for all and we all had a great time! Laura fashioned a day in the Tuscan countryside specifically to our requests, and we had a perfectly delightful day, highlighted by a visit, with lunch and a personal tour, of a farm that produces both olive oil and wine. If you want a day outside the city with gorgeous views of Tuscany, let Laura plan a perfect day for you. It was for us! Laura guided us for two days through the museums, palazzos, churches and culture of Florence. We couldn't have asked for a better guide. Her knowledge of Italian art, history and architecture is superb, and her talent for imparting her knowledge and enthusiasm for what we were seeing made the experience rich and rewarding. A plus for U.S. tourists is that she knows what needs to be explained because of the cultural differences. She took us to an local restaurant for lunch every day which was a plus! Laura took my family including two teenage daughters on a driving trip from Florence to Lucca and Pisa. Lucca was the main focus (and highly recommended) but the girls had to see the Leaning Tower too. Laura is from the USA but lived for many years in Italy. Her dual background worked well for us. She has an extensive art history background and it was a pleasure walking through a number of the Churches of Lucca with her guidance and insights. We would highly recommend Laura to anyone. Laura showed my family including two teenage daughters around Florence for two mornings. We would meet mid-morning and tour until 2 pm. This worked well-we could see highlights with her guidance and then double-back or explore other areas she suggested in the afternoon. Laura is from the USA but lived for many years in Italy. Her dual background appealed to us. She has an extensive art history background and it was a pleasure walking through the Uffizi with her. We would highly recommend Laura to all. Can we give Laura more stars? We would if we could. Laura KNOWS Florence and art history: she has obviously supplemented her art-history degrees by reading additional historical works about Florence families and artists. But what makes Laura such an excellent guide is that she is kind and thoughtful. Not an impersonal, haughty college professor. She answered our ignorant questions as if they were the most insightful ones she's ever heard. Laura's enthusiasm for Florence art is infectious. She's wonderful. Tours by Locals is a great idea and Laura is a knowledgeable guide for Florence and we do not think we could have chosen better. I initially chose her as, being born in America, we reckoned we wouldn't have difficulty in understanding her. It was a good decision. Laura organised a sensible itinerary and helped us buy the "Firenze Cards" that facilitated entry to the various sites. We think she provided more than she was was obliged to provide. No hesitation in recommending her. This lady was dynamite! The tours of the Uffizi and Academia Galleries were made more interesting by Laura's cherry picking the important pieces and going in length about their history, the artist background, Roman mythology impact, the Renaissance and Florence's importance in the world. We highly recommend her services! Laura was extraordinarily knowledgable and cheerful. Thank you so much for a fantastic tour of Florence. We only had one day in Florence and Laura took us around. She was so delightful and understanding of the limitations the older guests in our group. She was full of knowledge of the art and history of the beautiful city! She naturally found aspects of the city to appeal to each of us from 76 years old to 14 years old! She had a talents for building up the next stop on our tour and then presenting it and allowing us time to just simply enjoy! I have already recommended her to others. Laura was Excellent, again! We had a group of 15. Laura was prompt & immediately took command of our group & made us feel that she was 1 of us! Her knowledge of not only the subject matter, but, other ancillary facts was impressive. Every person in our group was appreciate of the fantastic time Laura provided. Well Done! We were lucky to have Laura guide us through the Pitti Palace and Boboli Gardens in Florence. She was a delight ! Laura was very professional, informative, engaging and excited about her tour. We would definitely schedule a tour with her again when we are visiting Italy! Thank you Laura for a wonderful introduction to Florence! She knows her stuff, really good guide! Laura learned of what our family had wanted in a tour and she tailored the tour beyond our expectations. She exceeded, delivered and presented an educational enthusiastic Academia and walking tour. Please consider Laura for your family's tour she will have you think about the time of creation, the political and cultural environment, the tools and material and how the community interpreted the piece of art. The tour of the Baptistry was breathtaking for us now, and she had us imagine the residents. 5-Star Plus rating for the magnificent walking tour of Florence with Laura G. We so enjoyed Laura's ability to bring the soul of Florence to life via her knowledge of history and art, and her wonderful story telling. After spending a half day with Laura we felt as if Florence had become our home. The pace was perfect. We did not try to cover too much territory. Sometimes less is more. We stopped for a light lunch and enjoyed getting to know Laura more personally. A must do on your first day in Florence. VERY knowledgeable and super interesting! Made our trip to Florence even better! Laura did a great job with our tour. Very knowledgeable and a pleasure to speak with. If I could give Laura a ten star review, I would. She guided my wife and me, along with another couple friends of ours, on a tour of Florence this past May. She was extremely knowledgeable, listened to our requests, and provided a day that will be with us forever. When we needed to alter our plans she accommodated, made suggestions and showed us fascinating parts of the city we never would have found on our own. We could not be happier with our time with Laura and recommend her with enthusiasm! Laura is: highly intelligent, personable, and extremely knowledgeable about Florence and its incredible culture. We booked Laura for two days, and could not have been more pleased. Laura is: highly intelligent, personable, conscientious, and extremely knowledgeable about the history of Florence and its incredible culture. We booked Laura for two successive days, and could not have been more pleased. Laura is not only very knowledgable, but knows how to pass that knowledge on to her clients. She is passionate about Florence and it's history and makes it come alive. She is also very considerate of her clients needs. She knows how to avoid or negotiate the always present your groups and finds the best viewing positions. All in all a very enjoyable two morning tours. Thank you again, Laura. Laura is extremely knowledgeable about the art and history of Florence (and art in general) and the perfect guide for this wonderful city. Laura met us at the exact place where our ship's bus dropped us off. She arranged for transportation to our first stop at the museum to see David. Skipped the line because of her planning. Then she walked us on a fantastic tour of Florence, taking us on a route where there was no backtracking and circling us to the exact location to meet our ship's guide to take us back to our cruise. She is fun to be with and is very knowledgeable. We would do a tour with her again. It is said that travel broadens the mind...inspiring a new perspective of somewhere familiar, or a treasure hidden in a place currently unknown. That is exactly what Laura Greenblatt accomplished during our 2 tours with her. Both tours were 5 star across the board. Every aspect of the tour from booking, communicating, planning and experiencing Florence was seamless. Her knowledge is vast - her insight extraordinary. Bonus - she is fun to be with!! Laura was a wonderful tour guide. Lots of energy. Lots of knowledge in many areas including the Jewish history of Florence, the general history of Florence, and the wonderful sculptures, statues, and artwork in the museums in Florence. I would highly recommend her. Laura was very knowledgeable and communicated well with our group and did an outstanding job of taking us through the history of the Luca area and pointing out the key sites. We would highly recommend her specially for groups of Americans, since she is American born. Her communications were outstanding. Had a wonderful memorable tour with Laura. She was knowledgeable, flexible and fun. Her local knowledge and love of Florence was such an asset. I would definitely recommend her and will use her again on a future trip. We spent a wonderful day with Laura as she guided us around Florence. Laura was easy to communicate with when we first planned our day and later as we fine tuned our plans. She responded quickly, making recommendations according to our suggestions. Laura was so knowledgeable about every aspect of our tour - history, architecture, art history as she guided us to many interesting and beautiful places. Our day was interesting as well as informative, and we will certainly ask for Laura again. Unforgettable experience. Marvelous tour. Wonderful guide. Thanks so much! Excellent service! Thank you Laura, it was such a great experience. Laura was simply phenomenal! Her knowledge of art history and of Florence was exceptional! Laura was extremely accommodating. We had a limited number of hours in Florence as we were there for just over 24 hours. Laura provided nuggets of information that made the tour all the more interesting. Laura also provided her card with contact information to our oldest daughter who will be studying in Florence in the near future. In our family's opinion, Laura is the choice for touring Florence! Thank you! Our family fell in love with Laura from the moment we met her. We spent three fabulous days exploring Florence and wished it could have been three weeks. Laura is articulate, knowledgeable, informative and conveys her love for the city in every word. All three days were amazing but our time together in the Uffizi was extraordinary. Laura was also very flexible and kind. I wish I could give Laura a ten star rating rather than just five stars. Florence is a jewel and Laura made it that much brighter. Our afternoon with Laura was amazing! She is an exceptional guide and we highly recommend her. We wish would have had more time in Florence to spend more time with Laura! Wow! We couldn't have had a better guide for our two days in Florence. Laura not only knows the city's best sights, but also the best restaurants. She ls an American who has been living in Italy for years, and has an art history degree. That alone was enough to make the reservation, but upon meeting we found she was also charming and funny. She made the experience come alive! These two days were priceless, however the fees were very reasonable for the value received. I reccomend her without reservation!!! This was my second visit to Florence and,once again, I asked Laura to be our guide. Thanks to her expertise and credentials, we were able to quickly access the Uffizi and Accademia and view the important works. She explained the history of the Medici family as well as the works of art and artists. We also visited several cathedrals. There is no doubt that we saw and learned so much more with Laura than we possibly could have on our own. Thank you, Laura, for a wonderful tour of Florence! A wonderful afternoon with Laura. She really knows Florence, and despite previous visits, we learned so much from her. She took her time--we never felt rushed and covered so much of the city's beauty and important sites. I would definitely recommend her ---tremendous knowledge of Italian history, art and culture. Thanks again! Laura's depth of knowledge of art and history are without peer. She gave us an amazing tour of Firenze and brought the history of the city to life with her stories. Her love and understanding of art shined at Accademia and Il Uffizi. We also asked to take us to The Great Synagogue and her historical/cultural insights were illuminating. Laura also found us a lovely non-touristy restaurant where our education continued. She adapted to our needs when our feet gave out at the end of the day. Bravo Laura! We set up three two-hour sessions with Laura over two days. She was excellent, prompt and lovely to work with. Most importantly she knows her stuff! Laura led us through the Accademia, the Uffizi and the Duoma with so much skill and knowledge. It was a terrific way to see several key sights. I highly recommend her! What a delightful, knowledgeable and personable guide, with a droll sense of humor to boot! We cannot rate Laura highly enough as someone who brings to life the history and art of Florence with such expertise and understanding. Brava Laura, and many thanks. Richard and Marie-Christine Slater. All our interaction with Laura was brilliant. She was very responsive via email in structuring our bespoke tour and on the day of the tour could not have been more inviting and informative. Her love and understanding of Florence was exactly what we had hoped and her relaxed delivery made our day a perfect introduction to the city. She recommended a wonderful place for lunch and another for dinner which provided the local feel we wanted and craved. MANY THANKS AND HIGHLY RECOMMEND. Laura was a fantastic tour guide in Florence, Italy. She's incredibly knowledgeable, personable, and funny. She answered all of our questions, and gave us a tour tailored to our interests. When we're back in Florence, we will ask Laura to show us more of the rich history and art of Florence. We spent a day and a half with Laura G. And it was amazing. We had such a great time, she was so informative and had a nice sense of humor. I would highly recommend her and can't wait to go back. Laura took great care in considering all of our preferences. Loved the furniture restoration! Will definitely do another tour, so much to see...so little time! Laura was a wonderful guide and a pleasure to spend the day with. We left with a new friend and a hug. She when out of her way to give us a feeling for the history of Florence and of course, an understanding of the art and architecture. As much as you could adsorb in a full day! Highly, highly, recommend her for both a newbie and an "experienced" Florence visitor. We did a rennaisance art and architecture tour of Florence with Laura; she tailored the tour to suit our desires. Spent 4 half days with her, and she is exceptional. I am sorry that we didn't have another day in Florence and one more to visit Luca together. What could be better than an American living in Italy for 20+ years, fluent in Italian; an artist, restorer, and art historian; she is an encyclopedia of knowledge. Book her if you can, and we only did half days because we are seniors. Laura was an excellent guide. She is extremely knowledgeable and we learned so much about Florence and it's rich history. She was very considerate of the need for a slower pace of walking and was most enthusiastic about all that Florence has to offer. We enjoyed our day with her and the private tour made the visit more meaningful. Laura was delightful, helpful, and full of interesting information. We spent 1 1/2 days with her and everything we did and saw was fabulous. She definitely knows her material, but she seems like she loves what she does and I felt she brought the buildings and art to life. Highly recommend! We spent three fabulous days with Laura in Florence and Tuscany. It was a pleasure to have her share her passion for the city of Florence - the history, art, architecture and culture with us. She was always mindful of what our interests were and was so very patient with our endless questions. Our day in Tuscany was wonderful! We visited Greve as well as the charming medieval hill town of Certaldo, where we experienced a food and wine festival! We will happily recommend Laura to our friends and family! Laura is very excellent tour guide, knows Florence, it's history and its art like the back of her hand. Laura is an excellent guide! Her knowledge and insight was fabulous and she is a delightful individual. I highly recommend Laura. A most pleasant and knowledgeable guide. Worked with me for months to accommodate us (five senior citizens - one in wheelchair)with specials tours and times and had options when necessary. Thoroughly enjoyed her company and expertise. Thanks, Laura!!! Seeing Florence through Laura' eyes was amazing. She was one of the best tour guides I have ever used. This was our second tour with Laura. Again it was excellent! She went above and beyond showing us sites and areas we had not seen our first visit to Florence. 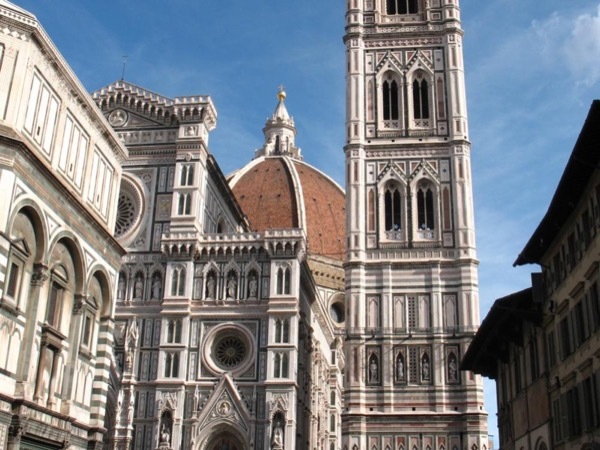 Our love of Florence is due the knowledge and experience we had on our tours! I highly recommend Laura. She is an expert in art and history. We were very pleased with Laura G as our guide. She was very professional , well informed, and spoke well to all of our family group, including children, adults and seniors. Thank you for helping to make our day in Florence very enjoyable and knowledgeable . Laura served as our guide to Florence on a three-hour tour. We set up our meeting at a convenient location where our family of 7 (ages 15-72)met her after we parked our van in a local parking garage. She was very informative as we walked from one great attraction to another always adding excellent background information especially on the powerful families and patrons of Florentine development over time. As an expatriate from the USA she demonstrated a great deal of knowledge of Florence. An easygoing tour guide with knowledge of the culture and history. She was good with our group, which was like herding cats. I would use her again. Laura was everything we expected. An expert on many things Florentine. An excellent knowledge of Italian art history, extending to the socio-political implication of what we saw. What was even more impressive was her perspective of how that history impacted the developing Religious-Political- Art of Florence. Definite five star plus rating. TOUR GUIDE RESPONSE: Thank you. I must say I really enjoyed spending these past 4 days with you and your family. I also really appreciate the opportunity to exchange knowledge from around the world. My very best to you all !!! We could not have been any more pleased with our customized Half Day private tour of the Uffizi and the Brancacci & Medici Chapels conducted by the most delightful, Laura. Her expertise with regard to history and the arts elevates her to the "creme de la creme " of tour guides - especially working in a museum like the Uffizi where the amount a good guide needs know is mind boggling to a layman. Her willingness to work with us to customize our tour was also much appreciated. BRAVO! We could not have been any more pleased with our Full Day private tour of Florence conducted by the most delightful, Laura. Her knowledge of the city and, most of all, her expertise with regard to history and the arts elevates her to the "creme de la creme " of tour guides - especially working in a city like Florence where the amount a good guide needs know is mind boggling to a layman. Her flexibility and willingness work with us to customize our tour was also much appreciated. BRAVO! Laura was an excellent guide! Her extensive knowledge created the perfect setting for an informative interesting and fun experience. She was generous in her interest to cover all the aspects of Florence that we had asked for and she was at all times thoroughly professional. We have had other guide experiences but none of them equal Laura. Thank you for a wonderful day Laura. We highly recommend you. Our tour was simply amazing. Our guide was SO knowledgeable and friendly. She customized the tour to meet our requests and the day was pretty much perfect. We loved getting to see the Uffizi with Laura! She was great with our kids and had so much information to share--I know that everyone in our family will forever remember this amazing visit, which helped us to navigate through the immense amount of art history that is in the Uffizi. My wife and I were very pleased with Laura. Laura is very knowledgeable, easy going and just a nice person to be around. I would highly recommend her to anyone. Laura made our tour of Florence and the Academia Gallery very interesting and exciting. She is very knowledgable on all things related to the history of the city and it's art work. TOUR GUIDE RESPONSE: Thank you Jay, it was a pleasure meeting you and spending a few hours together. We spent and incredible 2 days touring Florence (5 hours each day). Her knowledge of Jewish Florence was outstanding as well as her knowledge of the contents of the various attractions that we visited. We highly recommend Laura. Laura is a great guide. She was friendly and down to earth. Her Florentine knowledge was impressive and she related it with enthusiasm. My wife and I would happily book her again and I will recommend Laura to our family and friends. Laura was great! Highly recommend. Accommodated two adults and a 7 and 11 year old. Laura is a wonderful guide. She explained the history of Florence and the Medici dynasty. She has such a vast knowledge of art history and shares it in an easy to understand, interesting way. Our time spent with Laura certainly enhanced our stay in Florence. Thank you, Laura, for a wonderful tour! Laura is pleasant and extremely well versed with art and the historical facts of Florence. Unfortunately I think I booked the wrong tour. It was more like a class lesson with a lot of detail and we didn't seem to get any of the "fun facts or local flavor" of Florence. Unless our questions were directly related to the topic she was explaining we couldn't seem to get local information. Again, I don't blame her, what was described in the tour was exactly what we got almost to the letter. TOUR GUIDE RESPONSE: Hi Valerie, I'm sorry that the tour wasn't what you had in mind. It's true, my tours are really full of art and history, but I'm sorry we didn't get on the same wave length: I would have lighten up my talk and tried to be more fun and talk about life in Florence. I hope you did enjoy some of it anyway. Laura was an excellent host and guide. I can't even imagine trying to see Florence without her guidance. Thanks so much! Laura was an amazing guide! She knows so much about the history of Florence and every different building. We originally found her for a Jewish Florence tour, but decided to book her for the whole day and see more of the city, and we are so glad that we did! She crafted a tour based on what we were interested in, and talked about the history and significance of each place we visited with such a high level of knowledge. Laura gave us a fantastic tour and we would recommend her to anyone! Thanks for the opportunity of using your wonderful service. Laura was a warm, welcoming guide. She is knowledgeable and interesting and obviously loves the art and architecture of Florence! She has made me want to study Renaissance art!! Thank you again!! Laura was a great tour guide: very knowledgeable, friendly and accommodating. I'd recommend any of her tours to anyone. You'll learn a lot!